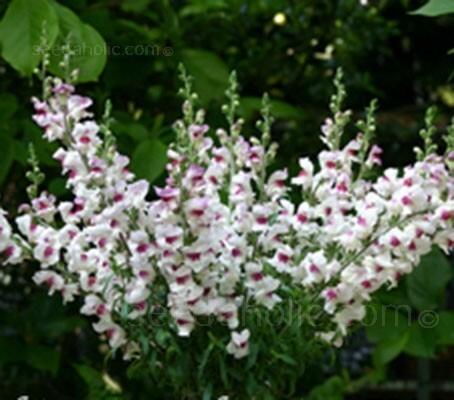 Antirrhinum majus are one of the most reliable flowers for the garden. Commonly referred to as Snapdragons, the plants have rich green foliage and in summer produce spikes of large, uniquely-shaped flowers that bloom on a central spike. Superb for contrast and for giving height to the border they also make an excellent cut flower. 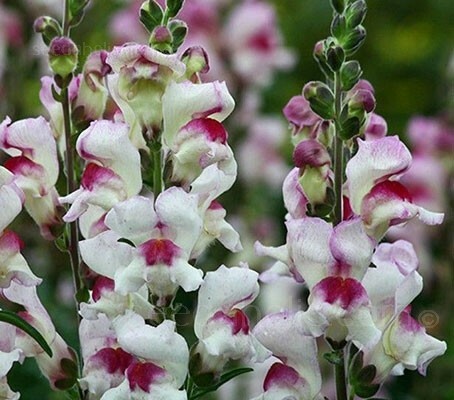 Antirrhinum majus ‘Lucky Lips’ blooms with distinctive contrasting bicolour purple-red and white flowers, a colour way that is often referred to as a 'silver bi-colour'. The robust plants grow to around 90cm (30in) tall and the densely packed spikes bloom in succession with spectacular large flowers on long spikes. If spent blooms are regularly cut back, the plants will flower from early summer right through to mid-autumn. They are an all-around excellent garden performer making a great display in the garden border or cut flower for the vase. Worldwide, Antirrhinum is one of the most important 'summer cut-flowers' grown from seed. They are grown year-round in greenhouses to be used by florists as cut flowers. 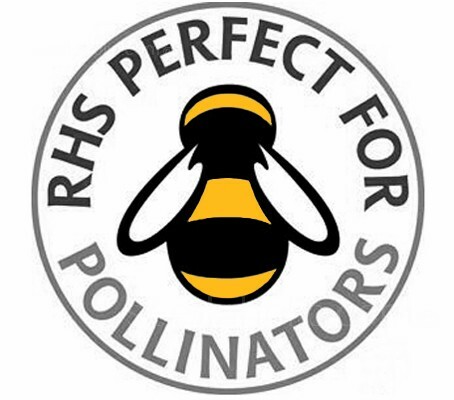 Though technically classified as a short lived perennial, they are often cultivated as an annual, sown early in spring to flower in summer, or as a biennial, sown in late summer to overwinter and flower the following season. Grow them in full sun, and space 30 to 45cm (12 to 18in) apart. After they are done blooming, trim the plants back, and they will quickly be blooming again. Some plants will die back in mid to late December, although many of them actually live for more than one year before dying off. 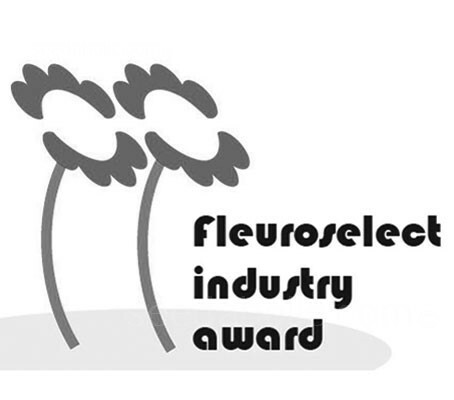 Antirrhinum majus 'Lucky Lips' has been awarded the Fleuroselect Award. The judges were impressed by its height and compact plant habit. This attractive silver bi-colour is ideal for adding height to borders or for cutting. Sowing: January to May or July to September. Although technically short-lived perennials, snapdragons are usually grown as annuals or biennials. Sow January to May under glass in gentle heat for flowers June to October. Or sow July to September in a cold frame for planting out in the garden the following spring. Sow at temperatures between 20 to 30°C (68 to 86°F). Sow on the surface of a good free draining, damp seed compost. Place the trays or pots in a propagator or seal container inside a polythene bag until after germination which usually takes 10 to 21 days. Do not exclude light or cover the seed as this helps germination. Keep the germinating seedlings moist at all times, remembering to water the soil only and keep water off the leaves. Antirrhinum can be sensitive to damping-off and other root diseases, so well-drained soil is imperative. Pay attention to glasshouse hygiene and use a suitable fungicide if necessary. Transplant seedlings when large enough to handle, usually after 5 to 6 weeks, into trays or 7.5cm (3in) pots. For bushier growth, pinch back young plants when 5 to 10cm (2 to 4in) tall. Grow on in cooler conditions for 10 to 15 days before planting out after all risk of frost. Snapdragons are slow to germinate, and gardeners have the best success from seed sown indoors but in mild areas they can be sown from mid April until end of May in beds in open ground. Select a sunny or lightly shaded location with moderately rich and well drained soil and sow outdoors only after all danger of frost is past. Cultivate soil and firm seed into the soil, keeping it moist until the plants are established. Snapdragons need frequent watering for the first couple of weeks after transplanting (daily watering in sandy soils). Once established, water when the top 2.5cm (1in) of soil feels dry to the touch. They do best in full sun, but can tolerate partial shade. Snapdragons need a very well drained soil that is rich in organic matter. Pinch back your snapdragons when they are a few inches tall to encourage branching, and remove old flowers after they have bloomed to encourage further blooming. Snapdragons are usually planted as bedding annuals, often with petunias or pansies. The short and dwarf snapdragon cultivars are excellent for border edges, raised beds and rock gardens. The dwarf and trailing cultivars are great in containers too. Use the taller varieties in the background or as the main feature in a mixed bed. Don't plant too deeply, or they may rot at the stem. Some of the tall varieties may need to be staked, use a twiggy branch for an inconspicuous support. They make great cut flowers, and are often grown in the cutting garden for use in bouquets. To encourage autumn blooming, cut back spent flower stalks after their primary late spring, early summer bloom period. Under favourable conditions, snapdragons will self-sow in the garden, most cultivars come true from seed. Cold tolerant to minus 8°C (18°F)., they are also deer and rabbit resistant. Beds, borders, patio containers and cut flowers. Wildlife gardens. Deer and rabbit resistant. Snapdragon flowers will last 1 to 2 weeks in water, longer in floral preservative. They are also suitable for drying. The flowers have a slight fragrance, depending on cultivar. Remove bottom leaves if present, recut stems under water and place into a fresh flower food solution. However, be careful not to remove too much foliage as excessive foliage removal can promote premature flower drop. Stem tip breakage can occur during harvesting and subsequent handling and is related to both flower colour and cell wall chemistry. In particular, red flowered cultivars break higher on the stem compared to yellow ones, which break lower. At this time there is no known cure other than preventative care by handling stems carefully. Stems are geotropic, tips bend up if stems held horizontally. Laying on a table for less than an hour may cause permanent bending. Therefore, store upright or if they have to be held horizontally, hold them at 0°C (32°F) to reduce or stop bending. Some references say removal of the top bud helps to deter the stem's geotropic bending. Allow flowers to mature and fade on the plant. Seed pods develop at the base of the flower and turn light tan to brown when mature. Attach a paper bag around seed pods using an elastic or string to catch the seeds as they fall. When the seeds are fully ripe, cut the stem at the base of the plant and shake the seed head inside the bag to dislodge the seeds from the casing. Native originally to North Africa, Spain and along the Mediterranean to Italy, snapdragons have become naturalised in temperate regions. They were favourite flowers in the earliest English gardens, research indicates that snapdragons were grown more for their beauty than for their medicinal usefulness. Snapdragons are easy to grow and have a long been used in gardens and in the cut flower industry. The brightly coloured blossoms can also be used to dye cloth. Snapdragons perform best in cooler weather and most cultivars can tolerate frost and an occasional light freeze. They don't do well in summer heat, and in hot areas, snapdragons are grown in the winter. Snapdragons belong to the Scrophulariaceae, or figwort, family. There are more than 3000 species in the family; common relatives include Foxglove, Veronica, Penstemon and Calceolaria. The genus name Antirrhinum, pronounced an-ti-RYE-num, comes from the Greek. anti meaning 'like,' and rhinos meaning 'nose', referring to the shape of the flowers. They often called 'calves’ snout' for the flower’s snout or nose like shape. The specific epithet majus indicates that this is one of the taller members of the genus. Commonly called Snapdragons, with their two-lipped flowers, they have delighted children for generations. Pinching the blossom makes the dragon's mouth open, and snap shut. There are about forty species of snapdragons, but the common snapdragon, which the famous garden writer, Gertrude Jekyll called "one of the best and most admirable of all garden plants", is by far the most well known. Large bicolour Purple Red and White flowers. January to May or July to September.